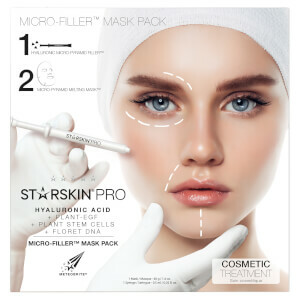 Reveal brighter, younger-looking skin with the STARSKIN PRO Platinum Peel Mask Pack, an at-home peeling treatment that works in just over 10 minutes. The two-step process begins with a leave-on exfoliating swab enriched with 10% Mandelic Acid, which melts away dead cells to smooth and resurface the skin. This is followed by a sheet mask infused with a Kale-based serum to hydrate, nourish and soften, while the foil back creates a sauna effect to improve absorption and effectiveness of the treatment. After use, the complexion will be bright, balanced and infused with a youthful glow. 1. Limpe o rosto e seque com uma toalha, sem esfregar. Abra o tubo pela linha picotada. 2. Passe cuidadosamente o cotonete no rosto e pescoço, evitando a área dos olhos. Não enxague. 3. Desdobre cuidadosamente e aplique primeiro a metade inferior e depois a superior. Deixe atuar durante 10 min. Remova e deite fora. 4. Massaje cuidadosamente o sérum restante e deixe atuar durante a noite, para obter os melhores resultados. Water, Mandelic Acid, Dipropylene Glycol, Glycerin, Butylene Glycol, Potassium Hydroxide, Trehalose, Propanediol, Schizandra Chinensis Fruit Extract, Zingiber Officinale (Ginger) Root Extract, Melaleuca Alternifolia (Tea Tree) Leaf Extract, Centella Asiatica Extract, Glycyrrhiza Glabra (Licorice) Root Extract, Aloe Barbadensis Leaf Extract, Camellia Sinensis Leaf Extract, 1,2-Hexanediol, Panthenol, Sodium Hyaluronate, Coptis Japonica Root Extract, hydroxyacetophenone, Disodium EDTA, Lavandula Angustifolia (Lavender) Oil, Xanthan Gum, Beta-Glucan, Sorbitol, Polyglyceryl-10 Laurate, Polyglyceryl-10 Myristate, Caprylyl Glycol, Linalool.